Padanaram is another name for the city of Haran. This location is 10 miles north of today's Syrian border - in Turkey along the Balikh River. 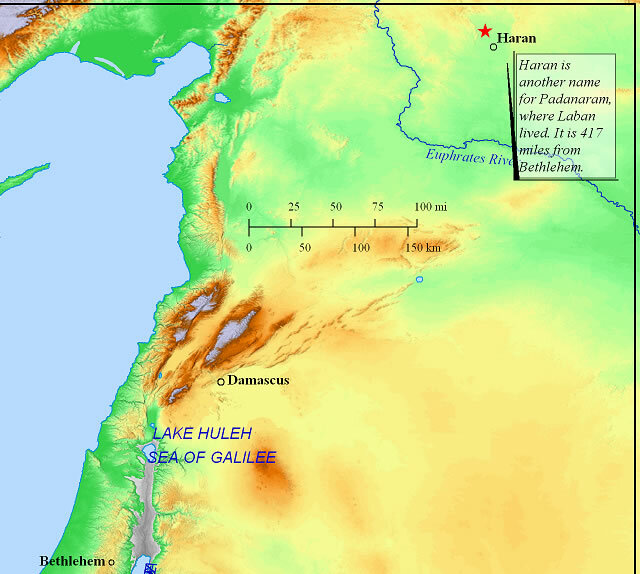 The following map shows that Haran, the home of Laban is far to the north of Bethlehem. As confirmed by current weather statistics, the climate in December in Haran is cooler by a few degrees than Jerusalem. Bethlehem and Jerusalem are only a few miles apart and at roughly the same elevation of 2,500 ft. So the valleys where the shepherds would have been tending flocks would be several degrees warmer in December than Haran. Genesis 31:38-40 tells us that Jacob tended flocks on even nights where there was frost, which is more frequent around Haran than the valleys around Bethlehem. So claims that it is too cold in Bethlehem for shepherds to be with their flocks in December are in conflict with with both Scripture and known weather data. Our appreciation to Heritage Advertising which is sponsoring the development phase of this website. 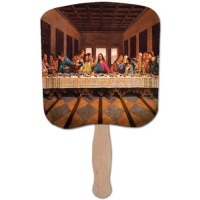 Click on the following image for Church Hand Fans and other promotional products from a Christian company.